Here's how the survey process works. Responding the survey is an easy process that gives you critical insight into your company's strengths and weaknesses along with the chance to rank among the Best Manufacturers and the Best Green Manufacturers in Oregon. The survey is open until mid-July. After signing up, Best contacts will be emailed a survey access code and a link to the employee survey. Employers can use a template for inviting employees to complete the employee survey online. Employees may take the survey on any computer or mobile device with Internet access. Invite all Oregon employees to participate. Senior executives and/or owners may not participate. For employees without computer access, you may request a hard-copy survey. The survey is also available in Spanish. A representative of management, usually an HR professional, will need to submit a separate survey, accessible with a unique survey link, detailing your benefits policies as they apply to most employees. 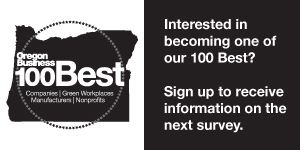 A minimum of 10 employees or 10% of your Oregon workforce, whichever is greater, must complete the survey by the June deadline. Your Employer Survey of Benefits must also be received by this deadline. Best contacts receive weekly updates on employee participation. Following completion of the survey, all companies that meet participation requirements will be able to order survey reports detailing strengths and weaknesses of their workplaces based on survey results. Companies are strongly encouraged to complete the feedback loop by communicating survey results back to employees. The Best Manufacturers to Work For in Oregon list will be released at an awards event in late October/early November and published in the November/December issue of Oregon Business magazine. Companies will be informed whether or not they made the lists in advance. Best Manufacturers will be free to use our logo in marketing and job recruitment. Here are some great reasons for your company to sign up for the Best Manufacturers survey: It's free, easy to facilitate, provides honest feedback and can boost workplace morale. There is no charge to take part in the survey. Employees may take the survey online from any computer or mobile device with Internet access or on paper in English and Spanish. One management representative, often the HR director, coordinates communications with employees and Oregon Business magazine. Employees get a unique chance to voice their opinions confidentially about a wide variety of workplace aspects and are impressed when it’s acknowledged. Employers gain valuable insight about the business from those on the front lines. All participants can order reports on survey results that detail workplace strengths and weaknesses, employee comments and benefits analysis. Survey reports provide opportunities to further the dialogue with employees and set priorities for workplace improvement. An event in late October/early November will recognize companies that have scored highly in certain workpalce practices. Highly qualified job candidates seek out openings at Best Manufacturers and it reinforces the pride and satisfaction of current employees to work for a Best manufacturer. The employee survey consists of 30 statements divided into six workplace categories. Answers to the first five categories count for 5/6 of the overall score used to determine the Best Manufacturers to Work For in Oregon. The sixth category, Sustainable Practices, is used to help determine our Top Best Green Manufacturers to Work For in Oregon. The employee survey consists of 30 statements divided into six workplace categories. Answers to the first five categories count for 5/6 of the overall score used to determine the 100 Best Manufacturers to Work For in Oregon. Employees rate the statements in terms of satisfaction and importance. The survey has six optional demographic questions, and two open-ended questions for written comments. Companies are scored based on average satisfaction ratings. • Do invite all regular full-time and part-time employees of Oregon locations to participate. Senior executives and owners may NOT take the survey. • Do not invite any employees working outside the state of Oregon to complete the survey. • Do not select a sample or subgroup of employees to take the survey. • Do not demand that employees take the survey, or imply in any communication with employees that they should provide positive responses. • Do ensure that employees know the survey is entirely confidential and anonymous. • No data is saved until the final page, so employees that quit the survey midway through should retake it. • Temporary employees and contractors are not permitted to take the survey. • Each employee may complete only one survey. • Encourage employees in all departments and compensation levels (hourly, supervisory, senior management, etc.) to participate. • A minimum of 10 employees or 10% of your Oregon workforce, whichever is greater, must complete the survey. Greater participation does not impact scoring: please encourage all Oregon employees to participate but do not coerce them into completing the survey if they do not wish to. • We will email companies weekly updates regarding the number of employees that have completed the survey. • Submit all online and hard-copy surveys by June 30 (or extended) deadline. Encourage employees to complete the survey online from any computer or mobile device with Internet access, at work or home. If they do not normally have access to the Internet, consider setting up computer kiosks and providing breaks for them to take the survey. 1. Distribute via email, bulletin or employee-only Intranet site the survey code and link provided in your Best instructions to all Oregon employees. Do not reveal your survey code outside of your company. 2. You may customize the sample e-mail/memo text (see below) to distribute to employees, informing them about the Best survey. 3. After accessing the link and entering your company's name and code, the survey will take employees about 10 minutes to complete. 4. If an employee quits the survey midway through, he/she should retake it. 5. You will weekly email updates indicating the number of employee surveys that have been successfully completed from your company. SUBJECT: Rate your job satisfaction in the Best Manufacturers to Work For in Oregon survey. [COMPANY NAME] is taking part in the survey for Oregon Business magazine’s 2018 list of the Best Manufacturers to Work For in Oregon. We encourage you to express your thoughtful, honest opinion on a comprehensive set of workplace qualities in the Best employee survey. Your participation and the answers you provide will be strictly anonymous and confidential. We hope that all employees from every department and location in Oregon voice their candid views in this survey. Each employee may complete just one survey. It takes about 10 minutes, and can be completed from any Internet-connected computer or mobile device — at work or home. Go to [SURVEY LINK] and enter our survey code: [COMPANY CODE]. Please note: your responses are not saved until you reach the last page of the survey. The deadline is [DEADLINE]. After the survey is complete, we can obtain survey results that may help us find ways to improve job satisfaction, productivity and performance throughout [COMPANY NAME]. We urge all employees with Web access to take the survey online. However, employees who do not have access to a computer, or cannot access the Web, may complete a hard-copy printed version of the employee survey. 2. We will e-mail you an PDF version of the survey to print, copy and distribute to any employees who do not have access to the Web. • Employee surveys that you collect and return to Oregon Business are strictly confidential. Do not read them or write any identifying information (such as employee name, etc.) on surveys before distributing them or after collecting them. • Because hard-copy surveys entail data-entry cost, organizations that submit more than 100 hard-copy surveys will be charged a handling fee of $50 for every 50 surveys processed beyond the initial 100. • Please encourage as many employees as possible to complete their surveys online. • All hard-copy employee surveys must be received by the July deadline. The survey is available in Spanish in hard-copy form. Spanish-speaking employees should not refer to it as they complete the survey online because the online survey is randomized. Instead, have them fill it out it according to the rules listed above for the English hard-copy survey. 2. We will e-mail you an PDF version of the survey to print, copy and distribute to Spanish-speaking employees. The survey is divided into six sections: Work Environment; Management & Communications; Decision-making & Trust; Career Development and Learning; Benefits & Compensation; and Sustainable Practices (used to determine the Best Green Manufacturers to Work For in Oregon). Within each section are 4 workplace qualities (10 in Sustainable Practices) on which employees rate satisfaction and importance. There is also an optional demographic section and two open-ended questions asking what employees like about their workplace and what they would like improved. • Satisfaction with the performance of their company in that area. • How important that particular item is to their overall satisfaction. How many years have you worked for your company? What is the highest education degree you have earned? Which of the following best describes your racial or ethnic group? • What about your company makes it great? • What about your company would you like to improve? A company representative familiar with your organization’s employment and benefits policies should complete the benefits (or employer) survey. It takes about 30 minutes. To access the Employer Survey, the representative will need the unique survey link sent to your company's Best contact in the survey instructions. Below is a checklist of topics covered in case your representative needs to gather information prior to taking the survey. • Answer each question as it applies to the greatest percentage of full-time equivalent employees in Oregon. • If you are unable to finish the survey in one session, click the "Come Back Later" button and your answers will be saved. However, you will need to finish the survey on the same computer or mobile device. • The employer survey counts for 1/6 of a company’s total Best score. The Sustainable practices section counts for 1/3 of the Best Green Manufacturers to Work For in Oregon score. 1. Review the benefits survey checklist above and gather necessary information. 2. Access the survey online with the unique link provided in the survey instructions email. This may be done from any computer or a mobile device with Internet access. 3. Answer all applicable questions until you reach the final page thanking you for taking the survey. 4. Within a week after submission, you will receive an e-mail confirming receipt of your completed survey. 5. The benefits survey is due by the June deadline. The confidential employer survey consists of 58 questions, providing a comprehensive analysis of company benefits policies. Answers from the first 41 questions count for 1/6 of a participating company's overall Best Manufacturers score. The 15 Sustainable Practices questions count for 1/3 of a company's Best Green Manufacturers score. There is one open-ended question for additional comments. 1. Does the employer offer a health insurance plan to employees? 3. Can employees cover their spouse and children? 5. Does the employer offer dental insurance? 7. Coverage for mental health care? 8. Coverage for alternative care (chiropractic, acupuncture, naturopathy, etc.)? 9. Does the employer offer fitness and/or wellness programs? 10. Does the employer offer life insurance? 11. Does the employer offer short-term disability insurance? 14. How does your company handle vacation and sick leave? • What is the maximum number of PTO days employees receive per year? (INCLUDE paid holidays whether fixed or floating; DO NOT INCLUDE days accrued or rolled over from prior years). • How many paid holidays do employees receive per year? • How many paid vacation days do employees receive after 1 year of service? • How many days of sick leave do employees receive per year? 15. Are most employees permitted to work flexible or compressed schedules? 16. Are employees allowed to do volunteer community service on company time? 17. Can employees donate paid time off to other employees in need? 20. Does the employer provide financial assistance for the adoption of a child? 21. Does the organization subsidize employees' childcare expenses or provide free/discounted childcare on-site? 22. Does the employer subsidize elder care expenses for employees? 23. Does the employer offer employees the opportunity to set aside pre-tax income in a cafeteria-style Section 125 flexible spending plan for qualified child care or dependent care expenses? 24. If yes, does the employer contribute to the plan? 25. Does the employer offer a cafeteria-style Section 125 plan for unreimbursed medical, dental, or other qualified health-related expenses? 26. If yes, does the employer contribute to the plan? 27. Does the organization subsidize employees' transportation expenses? 28. Does the employer make or match contributions to the employee's tax-qualified retirement plan? 31. Does the employer offer a skills-based rewards system, which financially compensates employees based on the number of skills they obtain that are relevant to the job? 32. Does the employer offer cross-training opportunities? 33. Does the employer have a perfomance-based employee pay and promotion system? 34. What percentage of the whole company's senior executives (VP or above) are women? 35. What percentage of the whole company's senior executives (VP or above) are racial/ethnic minorities? 36. Does the employer have a written non-discrimination policy? 37. Does the employer donate money, goods or in-kind services to community or charitable organizations? 38.Does the employer sponsor any volunteer community service activities? 39. What percentage of employees is eligible to participate in an incentive plan, profit-sharing plan or gain-sharing plan, other than as part of a pension plan? 40. What percentage of employees is eligible to participate in a stock option or stock purchase program? 41. Does the employer subsidize or discount employees' purchase of stock? 42. Does the employer have an employee stock ownership plan (ESOP)? 54. Sustainable facilities, such as LEED-certified buildings, weatherizing, remodeling with recycled/green materials, installation of solar panels, use of eco-roofs, etc. 56. Buying local materials, supplies, services, etc.